Release Date: May 5th, 2006 by Warner Independent Pictures. The Cast: Hiroyuki Sanada, Jang Dong-Gun, Cecilia Cheung, Nicholas Tse, Liu Ye, Chen Hong. BASIC PREMISE: After being cursed by fleeting love in exchange for beauty from a goddess (Hong), Princess Qingcheng (Cheung) flirts with a general (Sanada), an evil Duke (Tse), and a slave (Dong-gun). ENTERTAINMENT VALUE: Occasionally breathtaking visuals and gorgeous costumes don’t make up for a dull plot with poor character development. 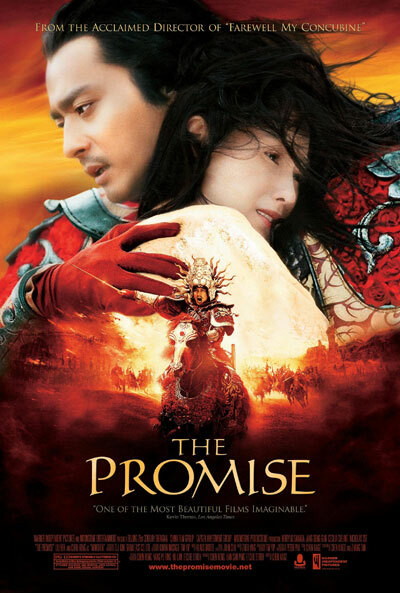 The film begins with promise (pun intended) as a young Qingcheng encounters goddess Manshen and accepts her offer of beauty but with one crucial catch: she will never be able to truly love a man unless snow falls in spring and the dead come back to life. Unfortunately, the second act when Princess Qingcheng grows into adulthood and runs into the general, the duke and the slave, feels too redundant and lacking in an engaging conflict. Too many flashy special effects, along with a fast pace, become too nauseating. Unlike Crouching Tiger, Hidden Dragon, there’s nothing really awe-inspiring about the visual effects—some of which looks too computerized. By the time the confusing, overlong third act comes, it’s easy to lose interest in the story and just watch the mildly entertaining, colorful visuals which are livelier than any of the characters. This all might have worked better as a cartoon instead of a live action film. Just like Qingcheng exchanges true love for physical beauty, writer/director Chen Kaige seems to exchange a good quality screenplay for beautiful visuals. INSULT TO YOUR INTELLIGENCE: A dull plot and weak character development. IN A NUTSHELL: Beautiful, yet overly flashy visuals, a dull plot and poor character development.